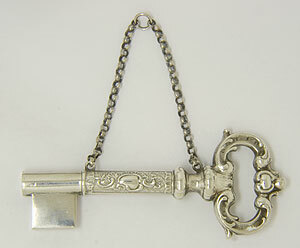 This extremely rare antique sterling silver knitter’s chatelaine is crafted in the shape of a key. A delicate floral design ornaments the key’s body while a flowing repousse pattern decorates the handle. 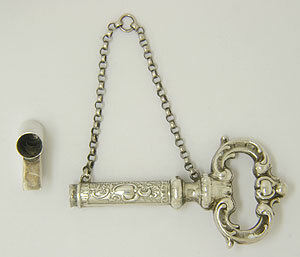 The part of the key that would normally fit in a lock detaches from the main piece allowing the key to serve as a guard for knitting needles. 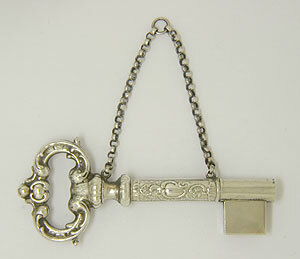 The key measures 4” in length and 1 5/8” in height. Dangling from the chain the entire piece measures 3 1/2" in height. Circa: 1850.